Mackerel feeding frenzy! Right beside the dive boat, guests of Miguel’s Diving watched schooling Big mouth mackerel feeding off Jinn Caves dive site. This small mackerel is found throughout tropical Indo-West Pacific seas. Its scientific name is Rastreliger kanagurta. In the Indian Ocean it is commonly called Indian mackerel. In the western Pacific it is commonly known as Big mouth or Mouth mackerel. Sometimes Long-jawed or even Rake-gilled mackerel is its common name. This fish is easily recognized. Its feeding pattern is distinctive. It filters microscopic marine life from the water by opening wide is mouth. Then it swims quickly into those pools of plankton. Its gill rakers strain food from the water. When its mouth is open, its head looks bigger. Notice in the video how the head flashes silver during mackerel feeding time. Notice in the video all the particles in the water near the surface. Those particles are living organisms plus some floating sticks and leaves. Surface winds and ocean currents have pushed plankton into the small cove near the dive site. This created perfect conditions for a mackerel feeding frenzy. Visibility below was nearly 30 meters. Big mouth mackerels feed on the smallest marine life forms. This included diatoms known as phytoplankton. They also eat microscopic animals known as zooplankton. Adults prefer macroplankton, like shrimp larvae and fish eggs. This fish is an important part of the diet in coastal areas of the Indian Ocean. It is canned, dried-salted and smoked. It is also made into fish sauce. In Gorontalo this fish is mainly ignored. Locals prefer Yellow-fin tuna, which is available in deep waters just off the coast. 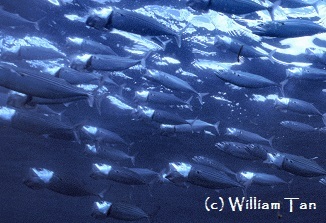 For your chance to watch Big mouth mackerel feeding, please book your dive trip with us.